Police have now released CCTV images as they appeal for help in solving an armed robbery. There were three shop robberies overnight in the Preston area. Officers say two of the attacks, in Lostock Hall and Ingol, could be linked to the same gang of three men. 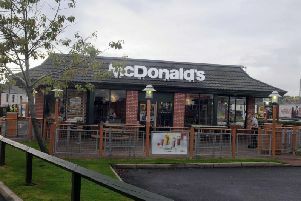 The other in Clayton-le-Woods was a lone robber brandishing a knife. The first raid happened at around 8.50pm on Thursday when a man in a Halloween mask (pictured) entered the Bargain Booze store on Preston Road in Clayton-le-Woods. Police say he held a kitchen knife to the throat of a woman shop assistant and demanded money. He made off with a quantity of cash and cigaretttes. Around 20 minutes later the BetFred bookmakers shop in Leyland Road, Lostock Hall was targeted. A male wearing a scarf around his face and brandishing a silver machete jumped over the counter and held the blade to the face of a female member of staff. The woman received superficial injuries in the attack and the man, who had two other males waiting outside the shop door, took cash from the safe and from the till before all three made off. The third robbery took place at 10.56pm at the Sainsbury’s Local store near to the Guild Merchant pub in Tanterton Hall Road, Ingol. This time three men carrying machetes and a sword entered the shop, jumped over the counter and made threats to staff. Self-service tills were emptied and a quantity of cigarettes was also taken. Police are appealing for information about all three of the robberies. Contact 101 or Crimestoppers on 0800 555 111.